The LOEWE Craft Prize is funded by the LOEWE Foundation, established as a private cultural Foundation in 1988 by Enrique Loewe Lynch, a fourth-generation member of the founding family of the LOEWE luxury fashion and accessories brand. The LOEWE Craft Prize reflects the brand and production values of the company. In April 2018 in Strasbourg, The Council of Europe awarded the European Museum of the Year Award 2018 to London’s Design Museum. The socially-aware museum was selected for its unique building, celebrating and exploring the magic of human creativity, and the objects, ideas skills and forces that shape our lives. It sets its collections in the context of global technological and cultural knowledge, providing a high level of interactivity and establishing an important democratic and multi-layered intercultural dialogue. 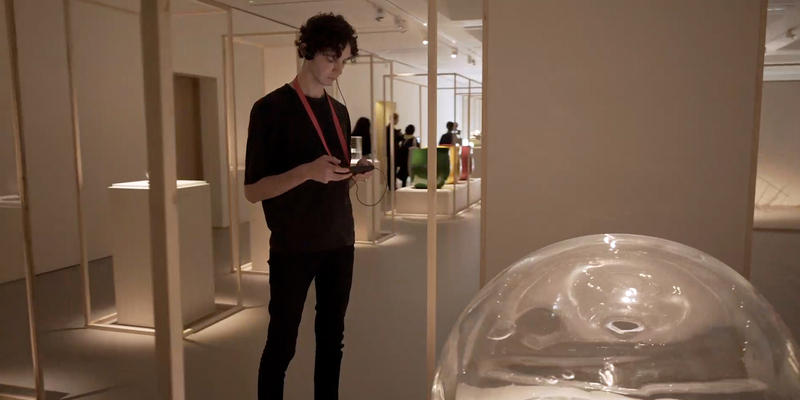 This demanding assignment committed Imagineear to create and deliver a full multimedia guide for the LOEWE Craft Prize 2018 Exhibition and the Design Museum, London within 48 hours, a challenge for a complex production in which quality and attention to visual detail was of paramount importance. The timeline was compressed because each of the 30 LOEWE Craft Prize 2018 finalists from 18 countries were in London only for two days, and the exhibition was to open to the public on the following day. Each finalist was to be interviewed on film and, where necessary, their contribution translated and sub-titled into English. On the second day, the overall winner was to be announced, and interviewed again. Under 24 hours later, by 10am on day three, the LOEWE Craft Prize 2018 Exhibition at London’s Design Museum was to be open to the public with a full multimedia guide showcasing every object and each artist. The shell of the multimedia guide was designed and built in advance, and video of each artist’s crafted object was shot on a revolving turntable. This allowed each piece to be viewed in motion to give dynamic context that went beyond what visitors would be able to see in the necessarily static museum displays. The 30 international finalists assembled at the Museum over the two days and were scheduled for interviews in two parallel pop-up film studios in their native tongues: Japanese, Korean, Italian, French, German and Spanish as well as English. The prize ceremony itself and the overall prize-winner were filmed on day two, with live edits taking place onsite up to 5pm the night before going live. Subtitles, coding, and final checks and adaptations were undertaken late into the evening, prior to uploading the finished guide to Imagineear’s own MPti™ devices. On day three, at 10am, the tour was offered to the public. The project demonstrated the speed and scale that Imagineear can bring to bear on a demanding project. We brought focus to preparation, communication, scheduling and roles, and teams of interviewers, film crew, hair and make-up crew, translators, video editors and schedulers in the onsite and back-office studios running in parallel to a very tight timeline. We were able to accommodate raw film shot the day before opening, working to two clients – the Design Museum and LOEWE – and in a demanding brand environment. The result considerably raises the bar on delivering ‘instant media’ to add to the visitor experience on site.